Soundtrack Saturday: "Grace of My Heart"
If you regularly read this column, I guess you noticed that there was no Soundtrack Saturday last week. I had a technology meltdown a couple of weeks ago that resulted in the death of my laptop and the temporary interruption of my Internet connection. I purchased a new laptop, but I was having it customized, which took a week; my Internet connection returned, but I was forced to use my ancient desktop, which runs on Windows 98. I’m lucky I could use the Internet at all — I think that computer is more suited for a game of Oregon Trail. The whole situation was a nightmare, and I felt like someone had hacked off an arm and replaced it with a Wiffle ball bat. But all is well now. My new laptop is wonderful, Internet is all fixed, and I feel whole again. I hope you didn’t miss me too much. Now, on with the show. I know Ferris Bueller’s Day Off is a tough post to follow, but I hope you’ll enjoy this week’s pick. 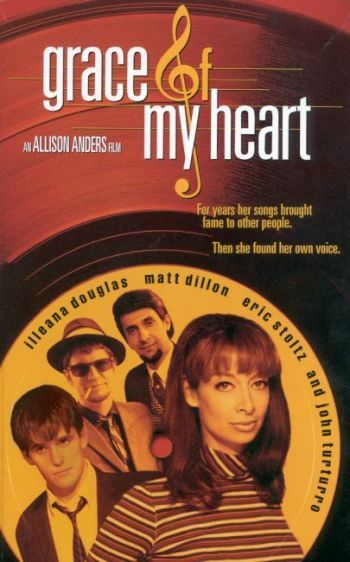 Directed by Allison Anders, Grace of My Heart (1996) tells the story of Edna Buxton (a.k.a. Denise Waverly), an aspiring singer-songwriter who turns to writing songs for other artists when she’s told there’s no place for her own songs in the early-’60s musical landscape. The film uses Carole King’s life and career as a fairly obvious template and follows Edna/Denise through two decades of personal and professional challenges, including two failed marriages — one to a Gerry Goffin-like songwriter (Eric Stoltz), the other to a Brian Wilson-type musical genius (Matt Dillon); an affair with a married DJ (Bruce Davison); raising kids as a single mother; dealing with the competition of other songwritiers (Patsy Kensit and Chris Isaak); handling her over-the-top agent (John Turturro); and trying to make her own singing career a success. Though Grace of My Heart didn’t receive rapturous critical acclaim or even decent box-office returns when it came out in the fall of ’96, I think it’s an excellent film with an outstanding star turn by Douglas and great direction by Anders. The soundtrack has a story just as interesting as that of Douglas’s character. Produced by Larry Klein, Joni Mitchell’s former husband and producer, it contains a plethora of songs that sound like they came straight from the Brill Building in the ’60s, written and performed by an incredible roster of performers and songwriters, including Elvis Costello, J Mascis (of Dinosaur Jr.), Gerry and Louise Goffin, Shawn Colvin, Lesley Gore, Jill Sobule, and Los Lobos. Though it appears Douglas herself is singing in the film, her vocals were actually performed by actress-singer Kristen Vigard (fans of the recently canceled soap opera Guiding Light will remember her as ingenue Morgan Richards, a popular character on the show in the early ’80s). The official soundtrack is pretty fantastic, but there are a few disappointments. Half of the songs performed by the film’s fictional girl group, the Luminaries, are omitted, as is one song by the Williams Brothers. Vigard’s version of “Hey There,” the song that kicks off Edna’s career in the film, is also left out, and her performance of “In Another World” is replaced by R&B group Portrait’s version. The most obvious substitution on the soundtrack is that of the Elvis Costello-and-Burt Bacharach-penned “God Give Me Strength”: Vigard’s vocals are used in the film, but the Costello-Bacharach version appears on the soundtrack. Another interesting substitution is that of “Man From Mars” by Joni Mitchell. Though performed by Vigard in the film, a version by Mitchell appeared on the soundtrack album’s first pressing; it was eventually pulled, and subsequent pressings include Vigard’s rendition of the song. From what I can tell, the soundtrack is pretty much out of print or very difficult to find these days, so I’ve provided the whole thing below as well as several additional tracks. There were quite a few songs that I couldn’t find, but I did manage to dig up some YouTube clips so you could at least hear them. Enjoy!